Born in Valod, Surat Distt., Gujarat. 1959-62 Handlooms Designer, Weavers Service Centre, Govt. of India. 1962-67 Research Assistant, NID, Ahmedabad. Curator of the exhb., Unknown India, organised by Dr. Stella Kamrisch, Philadelphia Museum of Art, USA. 1969-82 Member, Tribal Museum, Gujarat Vidyapith, Ahmedabad. 1978 Advisor, Minge International, San Diego, California. 1979 Attended Seminar on Vision and Visualisation, Tropical Museum, Amsterdam. Member of Handicrafts Board, New Delhi. Member, Lalit Kala Akademi, New Delhi. Member, Rareform Committee, New Delhi. Member, Sangeet Natak Akademi, New Delhi. Member, National Museum of Man Committee, Bhopal. Member, Tribal Museums Committee, Govt. of Gujarat. Visualiser, Sardar Patel Museum, Bardoli. 1979 Committee member for the Preservation and Promotion of Folk and Tribal Art in India, Ministry of Education, Govt of India. 1980 Trustee, Craftsmens Aid Fund, Gujarat Handicraft and Handlooms Corporation. 1955 Bachelor Degree in Fine Arts, Faculty of Fine Arts, Maharaja Sayajirao University, Baroda. 1959 Master Degree in Fine Arts, Faculty of Fine Arts, Maharaja Sayajirao University, Baroda. 1961, 62 Solo exhb., Ashok Gallery, Calcutta. 1963, 64 Solo exhb., Jehangir Art Gallery, Bombay. 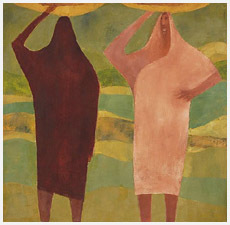 1964, 84 Solo exhb., Academy of Fine Arts, Calcutta. 1967, 68, 69, 75 Solo exhb., Gallery Chemould, Bombay. 1967 Solo exhb., Private Garden, New Delhi. 1968 Solo exhb., International House, Philadelphia. 1968 Solo exhb., Asia Foundation Gallery, San Francisco. 1969 Solo exhb., City Art Museum, St. Louis. 1971, 81 Solo exhb., Sanskar Kendra, Ahmedabad. 1976 Solo exhb., Gallery One, New York. 1991 Solo exhb., Bade Museum, Berkeley. 1993 Solo exhb., Art Heritage, New Delhi. 1996 Solo exhb., Cymroza Gallery, Mumbai. 1997 Solo exhb., India International Centre, New Delhi. 1998 Solo exhb., Durban Art Gallery, Durban. 1998 Solo exhb., Cape Town. 1999 Solo exhb., AIFACS, New Delhi. Awarded JDR 3rd Fund Fellowship, USA. 1971 Nehru Fellowship Award for research work on Tribal Art, Gujarat. 1975 Lecture tour on Tribal and Folk Arts, USA. 1980-84 Visiting Faculty of the School of Architecture, Ahmedabad.